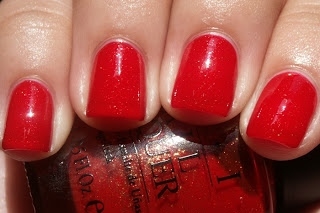 OPI Red Dazzle is a bright jelly bean red that has gold glitter inside it. Its glitter is understated compared to the flash in the pink Dazzle polish. It looks like it might have been sprinkled with pixie dust.